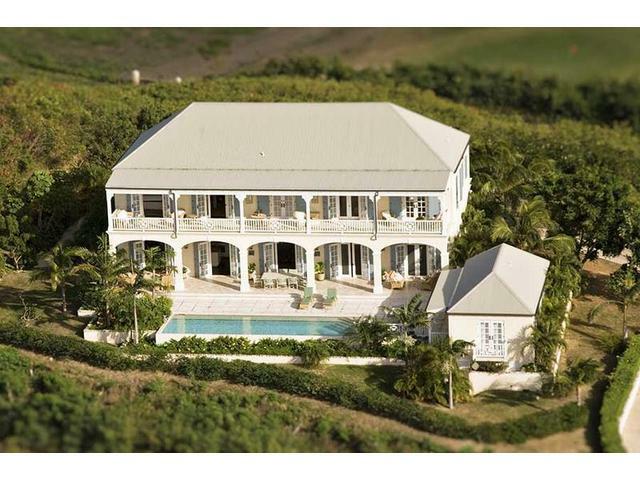 Estate Belvedere was built as a sugar mill in 1791 and retains its old world charm regardless of the recent upgrades. The interior showcases elements of design that reflect the quiet sophistication and are complemented by a choice selection of elegant furnishings. A modern gourmet kitchen with stainless steel appliances makes cooking a pleasure with the little added bonus of a delightful herb garden. Island Views is the grand result of luxury island living and excellent design for serene relaxation, indoors and out. Waterfront on its own peninsula, Island Views offers 2 levels surrounded by inspiring ocean views, conveniently within a few minutes' walk to 3 beaches and the nearby Chenay Bay Resort. The elegant great room features an eclectic blend of tropical rattan, sink-into sofas, West Indian and other antique pieces, accented by fine fabrics, original art, and an entire wall of custom bookcases. A desk with a computer and printer is opposite, for keeping in touch with those at home. 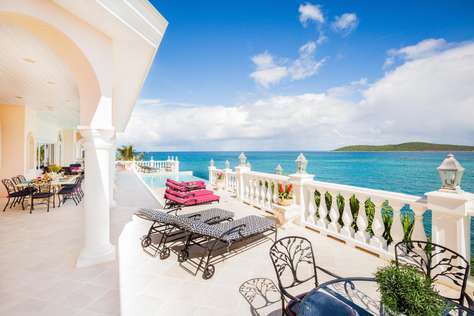 The great room is fully air conditioned, but french doors on the ocean side were designed to be thrown open to St. Croix's refreshing trade winds; they lead out to the sun deck and heated swimming pool, which are just a few feet from the water's edge. Off the east side are the gourmet kitchen and dining area - a chef's delight! A breakfast bar with stools separates the kitchen area from dining. The dining area is set with a large round table surrounded by french doors which open out to the pool deck on one side, and from the other sides, to an enticing oceanside patio with cushioned sitting areas and chaise lounges for cocktails, sunning and admiring the passing parade of yachts. A gas grill and large teak table await for alfresco dining on the patio. Along the east side rom this area is a smaller patio to catch the breeze, and a sunken hot tub tucked into the garden. On the opposite side of the pool deck, near the pool's reclining Buddha and waterfall, is the air conditioned exercise room. A limestone staircase gracefully ascends to Island Views' 2 bedroom en-suite bathroom suites above. A wide, covered balcony with cushioned chaises and benches connects the 2 suites, but both bedrooms are so well separated that one suite cannot be seen from the other. All bedrooms in the main house are air conditioned as well as the pool house bedroom and sitting room. The dining room is the only room on the main floor that is air conditioned. 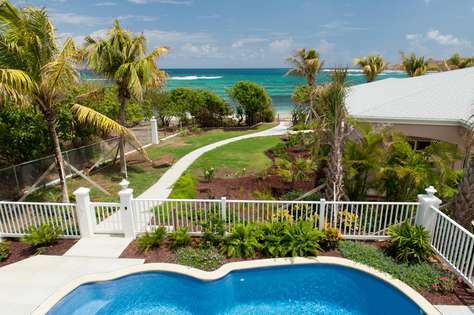 Rental Property Cruzan Sands Villa on the Beach is a brand new luxury beachfront villa located in the exclusive Estate Salt River on St. Croix in the US Virgin Islands. Our sandy beach, located just a few steps in front of the villa, is perfect! The clear water is tranquil and inviting. Swimming and snorkeling right in front of our villa are ideal! The views which capture your attention from every angle are breathtaking! If you are looking for a wonderful vacation in paradise, then you have found it here! 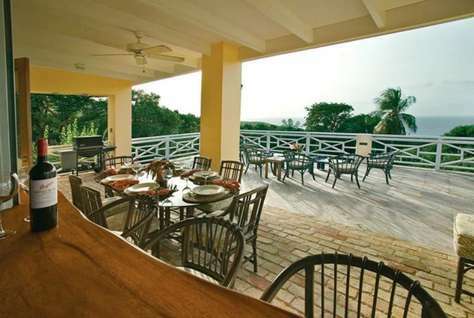 Cruzan Sands Villa sleeps 6 people comfortably in bedrooms, each of which has a private bath. We do have a sleeper sofa, which can sleep two additional guests in the living room at extra charge. Our gourmet kitchen is fully equipped. Our great room and our spacious decks, right on the beach, offer a Caribbean paradise dream come true! Cruzan Sands Villa has an open, airy great room, designed for vacation pleasure. Our casual and elegant tropical decor enhances the experience of living on the beach in luxury. You can relax on our spacious wrap around porch, protected from the sun and enjoy the magnificent views of the Caribbean Sea. Sun worshippers have a spacious deck on which to lounge by the fresh water swimming pool. The constant easterly breezes keep the villa cool and the ceiling fans in every room help to maintain the balmy, sultry feel that we crave. Optional air conditioning is available for those who want it. Vacation comfort is a given, with the villa’s large living area, designed for enjoying time with friends and family in a warm, sunny tropical setting. The flat screen TV and home theater system keep you close to home with news or allow you to watch a movie in comfort. Wireless internet is complimentary. Our wall to wall glass doors present the best views imaginable! A fully equipped kitchen with new, luxurious amenities such as granite counter tops and stainless steel appliances make cooking a joy! Dining can be inside or outside on the covered veranda. 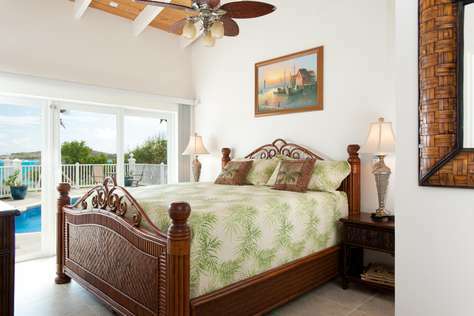 Two of our bedrooms are beachfront, with wall to wall glass doors that step onto the pool deck. Each has a King bed and ensuite bath. The third bedroom has the garden view. 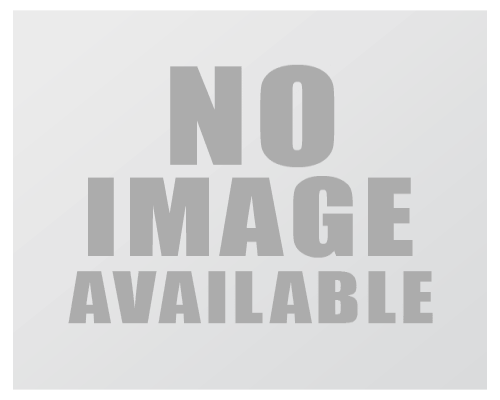 It has two twins, which can be joined to form a third King bed if desired. The third bedroom also has an ensuite bath. There is a powder room off the central living area hall. A fourth bedroom may be available in the Fall, if not already reserved, for two adults at additional charge in the separate Guest House. Our fresh water swimming pool is nestled in a beautiful garden setting, surrounded by a large deck with plenty of loungers. Right on the beach, the pool offers a refreshing splash after enjoying a swim in waters that are perfect for snorkeling, swimming or soaking. The gardens feature dozens of palm trees and prolific tropical flowering plants.